I t’s that time of year again – we can now reveal the hotly anticipated Umpf Social Media Hall of Fame listing for 2014! The table, which follows last year’s round-up of stunts and campaigns, has been compiled following a year where brands – both big and small – have sought to embrace the power of real-time, reactive marketing. Now in its fifth year, the Social Media Hall of Fame is not ranked in any particular order, but these are case studies that, for one reason or another, have caught our attention. The #putoutyourbats campaign paid tribute to Phillip Hughes, a 25-year-old Australian cricketer who died in November after being hit in the head with a cricket ball. It all started with a tweet by cricket fan Paul Taylor, who tweeted a picture of a cricket bat outside his home. 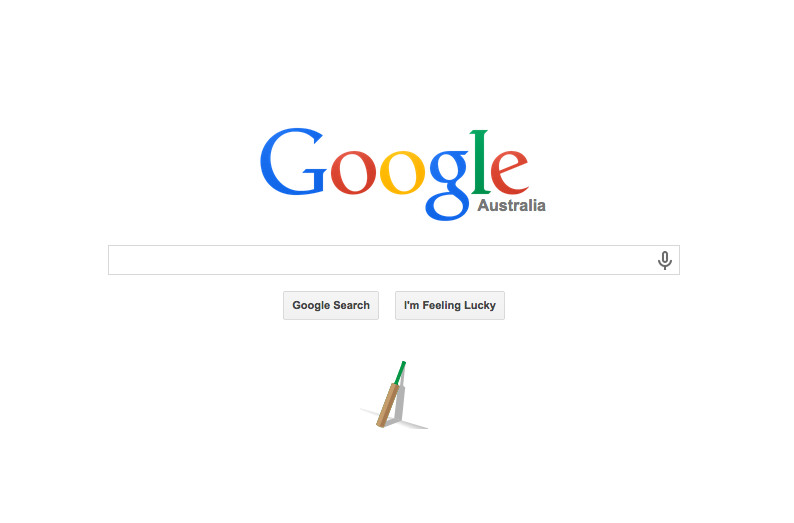 The simple but touching campaign captured the imagination of fans across the globe – and even Google joined in with its own moving tribute on its homepage. Positioned as the world’s first social network for drunk people; the debut of LIVR at SXSW was hotly anticipated. The only problem? LIVR was nothing more than an elaborate hoax. That didn’t stop the media falling for it hook, line and sinker, though. The brainchild of video producer Brandon Bloch and interaction designer Brandon Schmittling; both stress that the main goal of LIVR was to critique start-up culture and the media that covered it. We think it probably worked, chaps! A video blogger who was stopped by a stranger from jumping into the River Thames started a Twitter campaign in January using the hashtag #findmike to trace his Good Samaritan. Jonny Benjamin was on Waterloo Bridge in January 2008 after being diagnosed with schizoaffective disorder when Neil Laybourn intervened. The #findmike Twitter campaign trended in countries including Canada, South Africa and Australia, but it was Mr Laybourn’s fiancée who saw the campaign tweet and ultimately helped to reunite the pair. 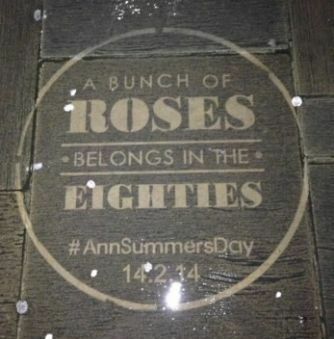 Merging guerrilla marketing with social media; Ann Summers’ #HappyAnnSummersDay Valentine’s campaign included tactics like cheekily projecting messages onto competitor shop fronts. The aim was to drive consumers to tweet @Ann_Summers using the hashtag #AnnSummersDay. It’s a bit naughty, and we like it! Global pizza giant Pizza Hut came up with an innovative social campaign in response to the hoard of romantic ‘proposals’ they receive through their social channels each day. The fast food chain set up an OKCupid dating profile and asked fans to send an Instagram video or Vine suggesting their most creative proposal idea with the hashtag #CommittoGreatness. The lucky winner bagged free pizza for life! Yet another Valentine’s campaign makes the list; this time from bottled water company, Evian. Although not groundbreaking in concept, it was a pretty cute and simple way of driving social engagements. 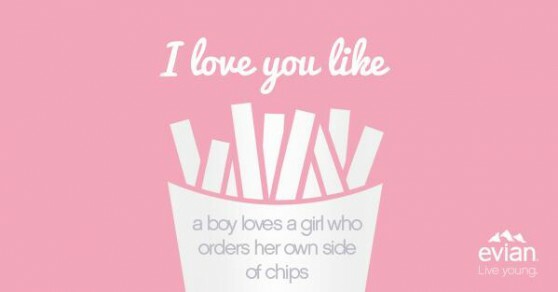 By tweeting Evian with the hashtag #ILoveYouLike, Twitter users received one of several Valentine’s messages, including ‘I love you like 80’s loved a power ballad’ and ‘I love you like a boy who loves a girl who orders her own side of chips’. Although this campaign kicked off at the end of 2013, it took us right through to Spring 2014 so we think it’s right to include it. According to LandRover, ‘Hibernot’ was about ’embracing the British winter, about enjoying winter in all its glory’. As well as launching the Hibernot website , which provided a hub for winter activities in the UK, Twitter users were encouraged to join the campaign and share their winter adventures by using the hashtag #Hibernot. At the start of the year football team Juventus successfully pulled off the world’s first ever social media choreography. Fans of the team had the chance to submit their own personalised choreography via a Facebook app for one of the most eagerly awaited games of the season against Inter. The winning entry was 16 year old Steven Kem, who got to see his design brought to life in one of the biggest matches of the season. The #LoveJu hashtag was also used to display messages of encouragement on the giant screens inside the stadium. Brewer Marston’s Pedigree launched its first app in February that lets users recreate old photos from their past. 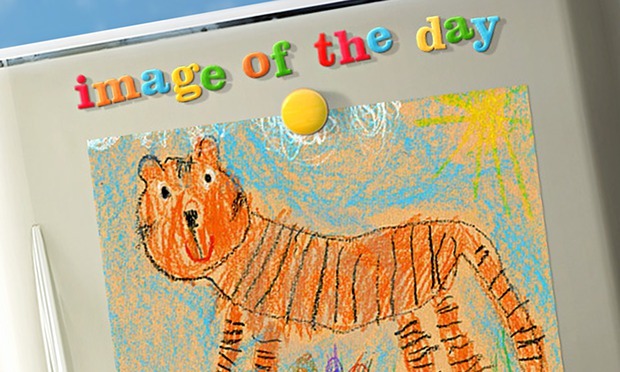 Images created on Life-o-Graph can be shared on Facebook and Twitter, plus prizes were available for the best snaps shared on the Marston’s Pedigree Gallery. It’s a great little idea. To promote the launch of the new Twingo model, car manufacturer Renault ran a teaser campaign that slowly unveiled the new car the more people tweeted about it. Renault launched #UndressNewTwingo, a “strip-tweet” which unveiled Renault’s fresh take on its popular city-car to the press and to the general public. For every 100 tweets, a new choreographed striptease was performed around New Twingo by a professional dance troupe, slowly unveiling the new design of the vehicle. We do love a good bit of reactive marketing here at Umpf, so when we saw Ben and Jerry’s tounge-in-cheek response to the legalisation of marijuana in Colorado, we liked it very much indeed. The tweet, which suggested a shortage of Ben and Jerry’s ice cream in Colorado (we’re presuming due to a bad case of the munchies) was retweeted almost 10,000 times. Worldwide Olympic Partner McDonald’s launched a social media campaign for the Sochi 2014 Olympic Winter Games, which was designed to connect fans from around the world with the Olympic athletes. 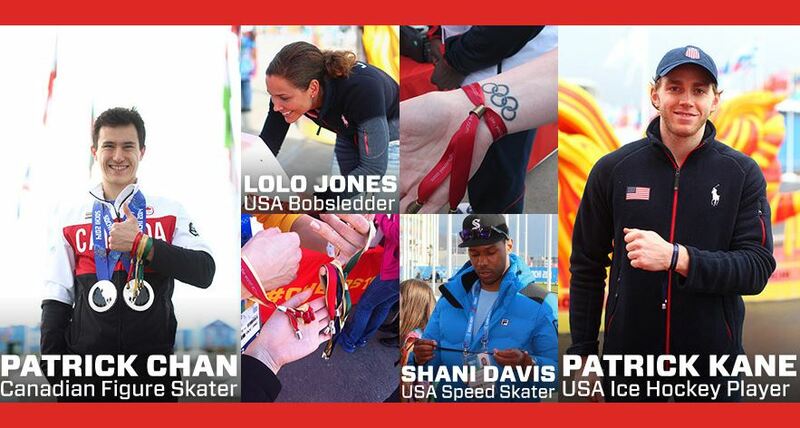 Supporters could send personalised good luck messages directly to their favourite athletes by using the hashtag #CheersToSochi on Twitter. These messages were then shared at a special display in the Athletes’ Village in Sochi, where athletes could view and print the messages onto ribbons to wear around their wrists. In January, Adnan Januzaj (a Man United football player) took Melissa McKenzie out on a date to Nando’s. Unfortunately, Miss McKenzie was less than impressed with the 18 year old’s choice of restaurant, after the football player (who earns £30,000 a week) paid just £18 for the meal. 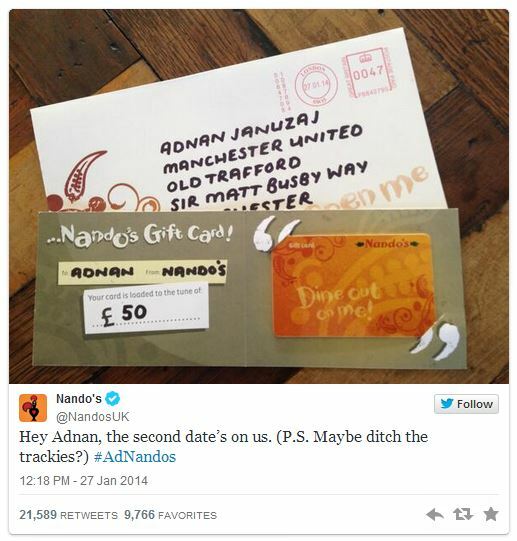 Never one to miss a trick, Nando’s offered to pay for the next date by giving Adnan a £50 voucher. The message, issued via Twitter using the hashtag #AdNandos saw over 10,000 retweets in an hour. In March, Oreo brought along its 3D printer vending machine to the 21st annual South by Southwest Interactive Festival in Austin, Texas. 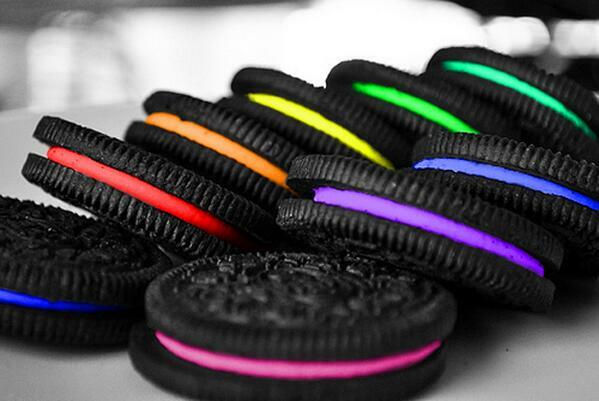 The 3D printing machine allowed people to create their own Oreo cookie based on what was trending on social media – in real time. The machine could make a unique and edible Oreo in less than two minutes. In a bid to drum up social buzz in the lead up to Mother’s Day, Paperchase launched a comical online video campaign which featured three rough-and-ready ‘hard men’ attempting to hand make Mother’s Day cards for their beloved mums. It’s funny, it’s shareable and we like it. WaterAid increased its Instagram presence by 12,000 followers in just one week after entering a single Instagram video to Instagram’s ‘Weekend Hashtag Project’. The 15 second Instagram video #WHPfromwhereiwalk features point-of-view footage of a woman in the remote fishing community of Brubeng, Ghana walking to collect unsafe water in Lake Volta. In a follow up to last year’s ‘Brotherhood’ campaign, Budweiser once again looked to steal the hearts of Superbowl fans with an internet-friendly (and quite frankly, adorable) advert showing a puppy that keeps managing to escape to see his best bud, a Clydesdale. 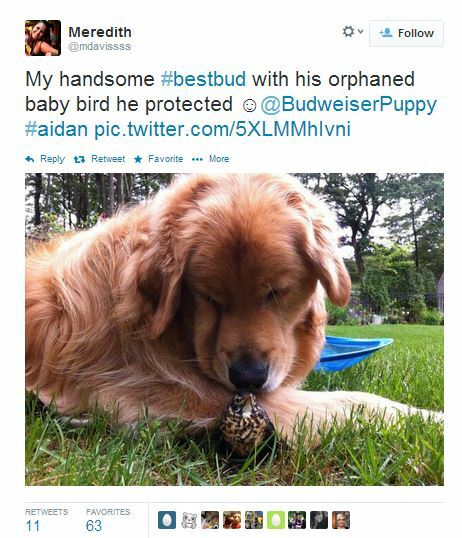 The pup was even given his own Twitter account, while fans were encouraged to tweet pictures of their furry friends with the hashtag, #bestbuds. As part of their ongoing ‘Sweeet’ campaign, mere hours after Chancellor George Osborne announced new plans for the future 12-sided pound coin Jaffa Cakes had lined up a belter of a reactive social stunt. In a tounge-in-cheek response to The Royal Mint’s Twitter announcement, the brand announced their own anti-counterfeiting ploy, in the from of a 12 sided Jaffa Cake. Heinz’s integrated ‘Grow Your Own’ campaign aimed to encourage people up and down the UK to grow their own tomatoes. The campaign served to drive home the message that every squeeze of their tomato ketchup contains a quarter of one tomato. 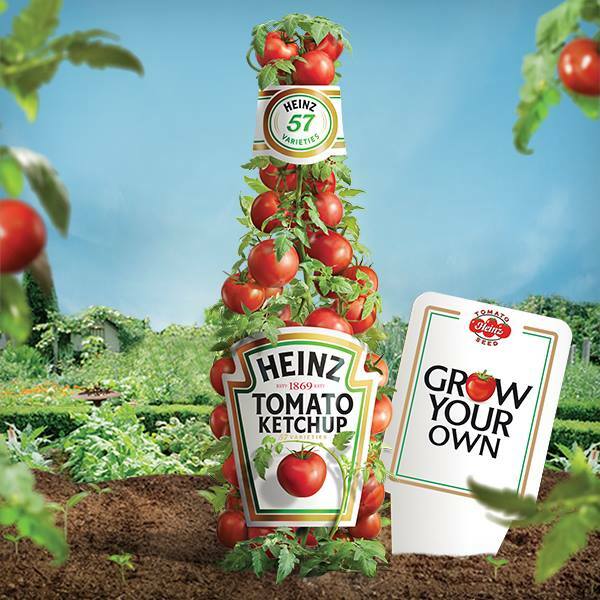 The integrated marketing campaign was launched via a dedicated ‘Grow Your Own’ hub on the Heinz Tomato Ketchup Facebook page. Fans were encouraged to post their photos throughout all the stages of growth on the ‘Patch Gallery’ on the Heinz Tomato Ketchup Facebook page to inspire other would-be tomato growers to take part, as well as for the chance to win Heinz Tomato Ketchup branded gardening goodies. Yet another Mother’s Day themed campaign secured a spot on our coveted list; this time from Oxfam. Over a five day period the charity aimed to create the largest (and happiest) Mother’s Day card, with messages submitted either through Twitter (by using the hashtag #OxfamMums) or directly through the website. The card was made up of lots of little squares that were filled with dedications to mums. Artist Lizzie Cullen then transformed all the dedicated squares in real time into a beautiful piece of art. This campaign allowed Facebook users to send personalised video clips of Jamie Redknapp hosting a fictitious show called ‘Redknapp’s Grassroots Round Up’. Users could insert photos of their friends into the videos and choose specific criticisms to make it appear as though Redknapp was giving their mates a dressing down. In March 2014 (seemingly out of obscurity) Facebook News Feeds everywhere became littered with pictures of ‘no makeup selfies’. 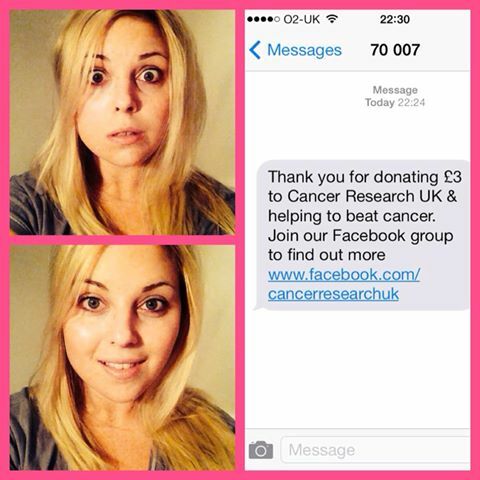 Women began posting barefaced pictures of themselves whilst making a donation to Cancer Research, in a bid to raise awareness about breast cancer. The viral trend was criticised by some who doubted its efficacy, yet Cancer Research reported that it received more than £1million in donations from the campaign. It’s a great example of a charity piggybacking on a social campaign. Earlier this year, online takeaway delivery service Just Eat launched a campaign that played a literal take on the age-old idiom, ‘Sing for Your Supper’. Fans were asked to share video clips of themselves singing takeaway related songs to be in with a chance of winning up to £249.99 worth of vouchers. Campaign supporters included Bec Hill, Duke Beatbox, the South London choir and more. Combine clever digital stuff with chocolate and you can’t really go wrong. 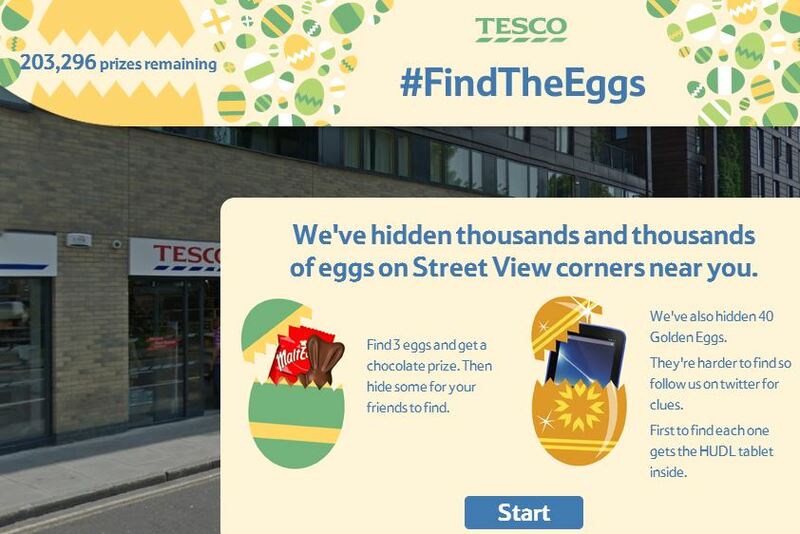 In the lead up to Easter, Tesco used the Google Maps API and did some pretty nifty stuff to it. The result? A digital Easter egg hunt! You can see it in all its beauty, here. By finding three eggs, the user unlocked a voucher for a free Malteaster Bunny (the best kind of Easter chocolate!). There were also 40 Golden Eggs hidden, which would reward the finder with a brand new HUDL tablet. 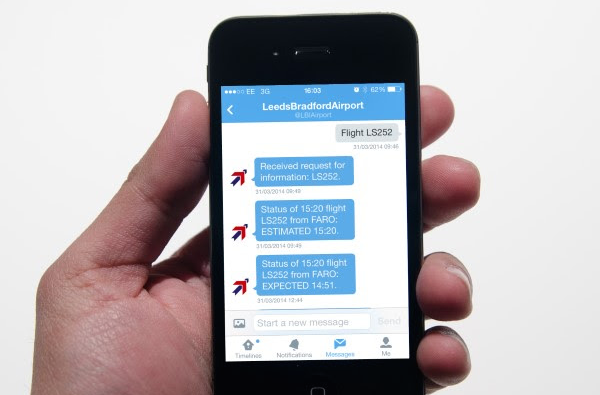 In April, Leeds Bradford Airport launched an application which shares live flight data via Twitter. Passengers can now simply direct message @LBIAirport their flight information to receive updates directly to their device as they appear on the airport’s departure boards. The feature can also be used by those collecting arriving passengers, and users can receive notifications as soon as their gate opens. To celebrate reaching 50,000 Twitter followers, train operator East Coast teamed up with the artist behind @drawnyourtweet to offer a personalised, limited edition sketch to ten lucky tweeters. 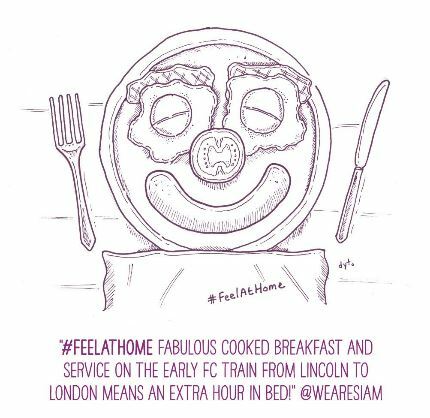 East Coast chose from Twitter followers who posted an update which included the hashtag #FeelAtHome – from the brand’s ‘Feel At Home’ marketing campaign – in the tweet. 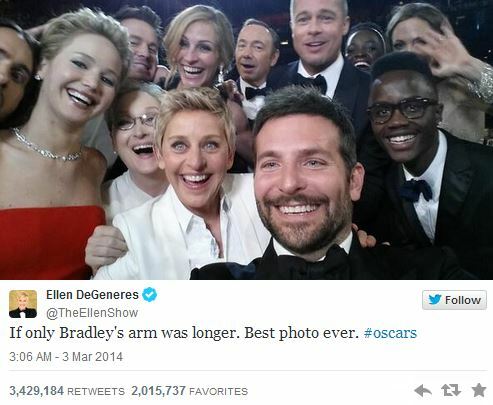 Pretty much everyone will have seen Ellen DeGeneres’ Oscars tweet that went global back in March. Ellen’s celeb selfie was taken on a Samsung phone, yet didn’t feel promotional (although viewers saw what phone was being used). Devised to tie-in with the release of ‘The Amazing Spider-man 2′; earlier this year Evian looked to encourage all of us to let our problems go and release our ‘inner baby’. Evian asked its Twitter followers to tweet their problems using the hashtag #AmazingBabyRescueMe, where the Amazing Baby character provided fun tweets, Vines, and illustrations to cheer them up. Throughout the campaign, content was also curated on the Amazing Baby Pinterest board. An inspirational 19-year-old who was diagnosed with terminal cancer at the age of 15 used his final days to raise over five million pounds for the Teenage Cancer Trust. 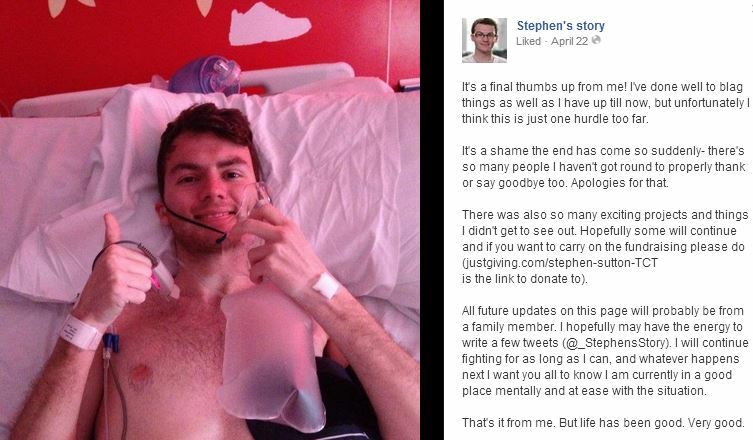 After posting his ‘final thumbs up’ on Facebook, donations flooded in to Steven Sutton’s Just Giving Page; smashing his original target of £10,000. The fundraising effort was amplified by comedian Jason Manford (and a whole host of other celebrities, including John Bishop and Tim Minchin) who encouraged social media users to share a thumbs up selfie with the hashtag #stevensstory to raise awareness. His goal was part of a bucket list written after he found out his cancer was incurable. Nowadays, it’s commonplace for diners to reach for their camera phone before their knife and fork. So-called ‘foodstagrams’ often make up a large proportion Instagram pictures – and South African restaurant El Burro used this to their advantage in April this year. The restaurant installed a device that enabled customers to take professional-style Instagrams of their meals. A small, portable lighting studio was placed inside the restaurant as part of its #dinnercam campaign. Once the diner picked the perfect ambient lighting, they could take a photo with their smartphone and upload it onto Instagram. Those who tagged their image with the #dinnercam hashtag also received a free physical print of their photo. Totally unnecessary, but we love it! 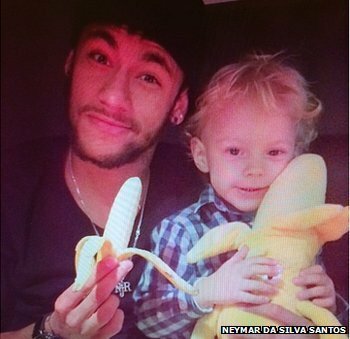 Back in April the world went bananas (sorry) over a tweet sent from Brazilian footballer Neymar. After fellow Barca player and Brazil international, Dani Alves had a banana thrown at him on the pitch in a match against Villareal, Neymar posted an image of himself on Instagram with a banana, side by side with his toddler son. Under the picture was the hashtag #weareallmonkeys. Inspired by Neymar, over 100,000 people went on to use the hashtag – with celebrities and ordinary people alike striking poses with a banana in hand. Intentionally or not, Neymar created one of the most popular anti-racism memes of all time – nice one! On September 8, 2013, 3,111 acres around the summit of Mt. Diablo near San Francisco went up in flames after a wildfire wreaked havoc throughout the area. A group called Nerds For Nature decided to monitor how the landscape recovered after the fire by encouraging members of the public to take pictures from fixed locations for a year after the fire. The crowdsourced images were collated via specific hashtags to create a timelapse of fire damage recovery. For the launch of the Dolce Gusto coffee machine, Nestlé decided to target their 25-35 year-old audience on Facebook—the internet’s coffee house. The idea? Creating mini coffee portraits. They worked with a world-renowned coffee artist to create real-time coffee portraits of fans who commented on campaign imagery. They also worked with Dolce Gusto retailers (e.g. Debenhams, Argos, Curries) to create unique coffee art versions of their logos to be posted from their social channels. Earlier this year the Twitter hashtag #GiveGregAHoliday began trending in the UK after a security guard at the Arcadia retail group accidentally sent his holiday request to the company’s 3,500 staff. It even out-trended the European elections! The event provided an interesting example of how brands can react quickly to opportunities in social. Brands from all over quickly decided to piggyback on the hashtag, including travel company Trek America who led the way by making the decision to offer Greg a free adventure holiday in the US. TopMan, Miss Selfridge, BHS, Burton Menswear and more all jumped on the bandwagon and offered free additions “to help Greg enjoy his trip”. Vogue’s 1.9million followers on Instagram are now able to buy items directly via the social photo-sharing platform, thanks to the LIKEtoKnow:IT Insta-shopping tool. Followers must first sign up to LIKEtoKnow:IT to link their Instagram account, then it’s just a double-tap to shop the items that feature in the image – users will receive an email linking them to where to buy, and Vogue will receive commission for each purchase made through Instagram. Very smart move, Vogue. Is this the future of online shopping? Anti-smoking charity, Quit, created a campaign for World No Tobacco Day, with three different looping Vines, each displaying a different type of smoker. Each one ends with the simple line “before this video starts again, another smoker will die”. It’s a simple yet powerful message. In May, Adidas announced a new app that allows people to put their favourite Instagram pictures onto the new ZX Flux shoes. 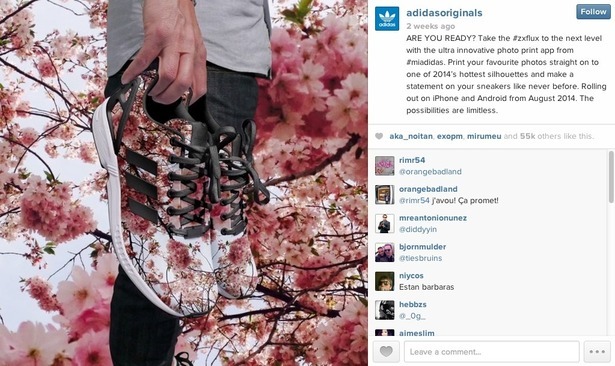 Adidas fans can now use the Adidas Photo Print app to customise their shoes via the social network. Based around the hashtag #DontWait, Coors Light launched a multi-channel campaign that gave consumers the chance to bid for a range of experiences and trips. 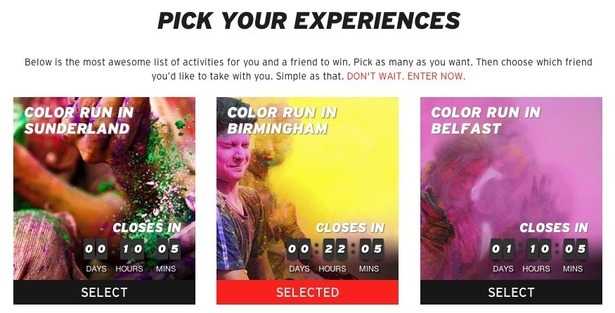 To enter, users had select the experience that most appealed to them and were encouraged to share their choice on Facebook. Holiday Spam has to be up there with our all time favourite mobile marketing campaigns, sharing the podium with Be More Dog and Dancing Pony. This fully integrated campaign from Three ticked all the right boxes this summer; poking fun at holiday over-sharers whilst raising awareness of their overseas mobile internet browsing services. 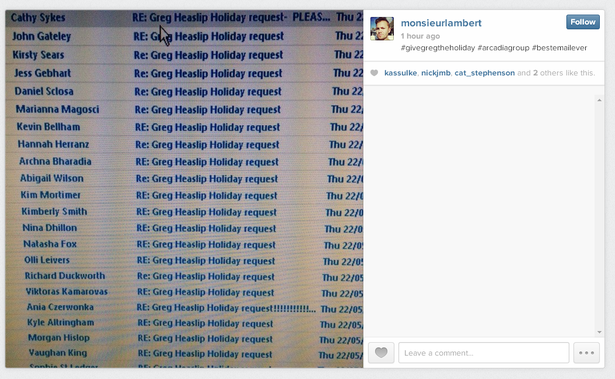 And, their Holiday Spam Crisis Centre is a thing of absolute beauty. Hats off to you, Three. You’ve done it again. 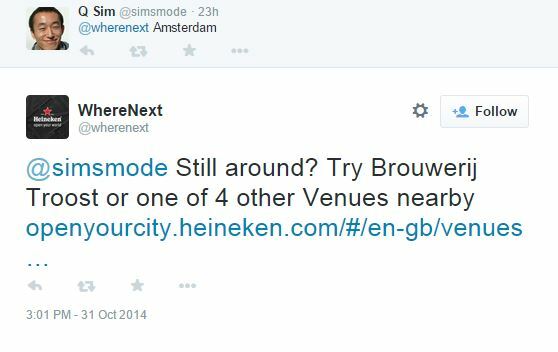 Heineken created a new social tool on Twitter this year as the next phase of its global Cities of The World campaign. The beer and cider brewer controversially omitted its own brand name to provide ‘more credibility’. The @wherenext bot was designed to help consumers “unlock the secrets of their city” by providing restaurant, café and bar suggestions based on their location. It uses an algorithm that listens to social media activity, such as tweets, check-ins and photos across Twitter, Instagram and Foursquare to analyse which locations are trending. Whether you loved it or hated it, no-one can contest that the ALS Ice Bucket challenge was a veritable sensation on social media in 2014. Yes, seeing the 100th video on your Facebook timeline of someone dumping a bucket of water over themselves may have become a little tedious, but you can’t argue with the £7m raised in support of ALS (or Motor Neurone Disease). ALS sufferer Anthony Carbajal explains in this emotional video why the campaign was so important to people suffering the disease. 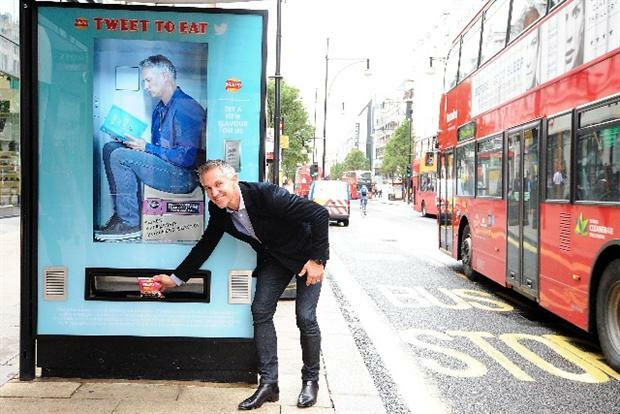 In August, Walkers transformed three London bus stops into tweet-activated vending machines as part of its ongoing ‘Do us a Flavour’ campaign. And what kind of Walkers campaign would it be without the endorsement of Gary Lineker? Bus shelters in Clapham Junction and two in Oxford Street were set up with tweet-activated vending machines. Passers-by were then encouraged to tweet @Walkers_busstop to get hold of their free packets of crisps. 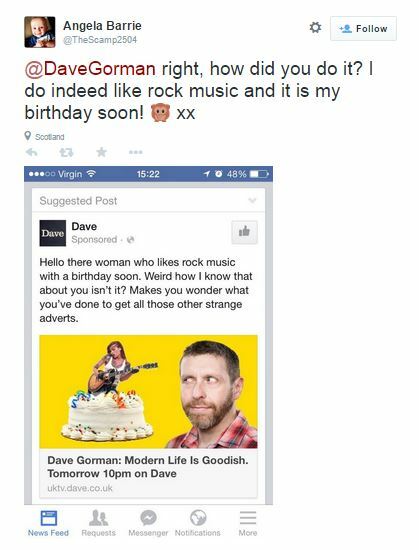 For those of you who don’t already watch Dave Gorman’s ‘Modern Life is Goodish’ over on Dave – firstly, do! In a bizarre mix between stand-up and documentary, Gorman’s diatribes tend to focus on the pitfalls of modern day life. What better way to promote it than with a sponsored Facebook post to a custom audience deliberately designed to totally creep the user out? Barnardo’s are usually pretty clued up when it comes to their social media campaigns, and The Nation’s Fridge Door is no exception. Their social media drive encouraged users to take a picture of their child’s achievement, worthy of their fridge door, and upload it to ‘The Nation’s Fridge Door’. The purpose? To raise awareness of the children who don’t have that kind of support. The interactive microsite received a flurry of entries in no time, and now provides a legacy piece for Barnardo’s and the incredible work that they do. Can you think of anyone who wouldn’t like free pizza? Exactly. Domino’s launched a cool community engagement campaign using the Google Maps API earlier this year to mark the launch of their new heavenly (and seriously calorific) cheese and bacon crust. Users would search and scroll through the map to find a pizza, then tweet its location with the full street name (eg #DoughStreet) with #DominosDash to get their mitts on a free pizza. 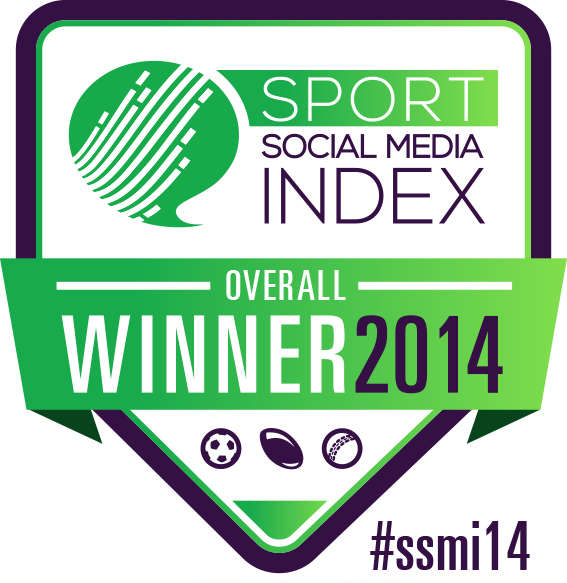 The Sport Social Media Index is an annual league table of all 148 British professional football, rugby and cricket teams, ranked according to the best use of social media by their official club channels. Launched in 2013, the multi-award-winning annual Index is compiled by measuring the social media performance of each team based, not just on an algorithm, but research from a team of seven people who looked at eight social networks. The Index includes an overall table of all 148 teams ranked top to bottom, plus nine additional tables showing rankings based on each sporting league. Leicester City topped the table this year, followed by Leeds United and Ipswich. In case you hadn’t noticed, I’m a real fan of #InstaFood. A real fan. Combine free food with Instagram and I’m totally sold. 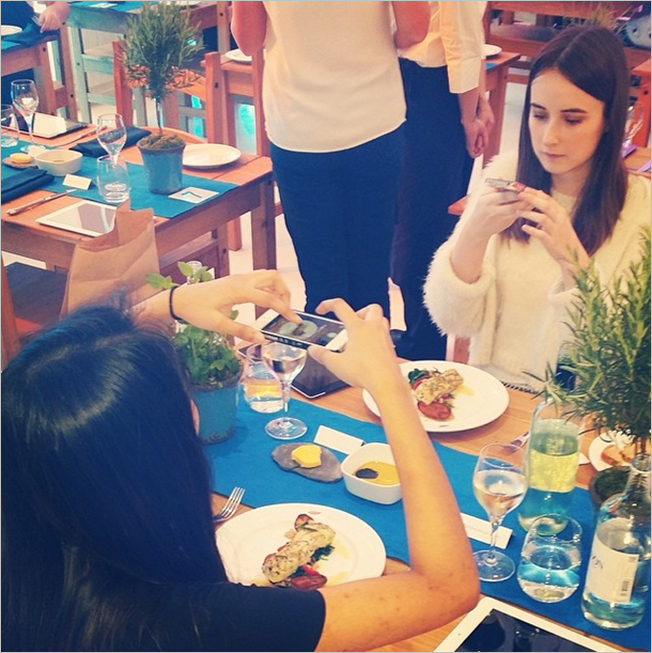 Way back in May, a pop-up restaurant in London allowed customers to settle their bills with Instagram shots of their meals. Customers ate for free at The Picture House if they included the #BirdsEyeInspirations hashtag with their uploads to help promote a new line of frozen entrees. 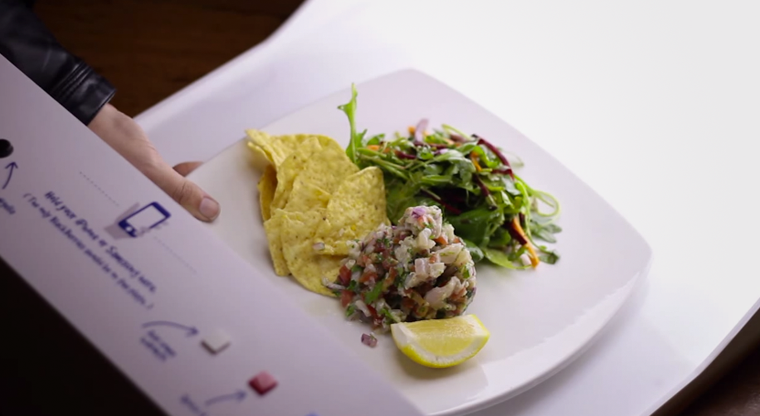 A professional food photographer was also on hand to provide Instagram tutorials for diners. The best viral videos are the accidental ones. And for a small unsuspecting Scottish travel agent, they found out the hard way. Thorne Travel appeared to blow a year’s worth of marketing budget on an amateur video ad, which is the most endearingly terrible thing we’ve ever seen. The plus side? Thorne Travel reported a 50% boost in bookings since the video flew to all four corners of the internet. Disclaimer: this video cannot be unwatched. Expedia, the online travel agent, launched it’s ‘Travel Yourself Interesting’ campaign by promising to transform mundane tweets into “fun content”. It was kicked off with a tweet by TOWIE star Jessica Wright that said: “Can’t wait for tonight with the girls but hope this rain clears up! Birthday girl tomorrow”. The message was then turned into a song in New York, filmed, uploaded onto YouTube and tweeted back. Participants using the #tyi hashtag were offered the chance to win a range of prizes. Oreo’s #snackhacks campaign was inspired by picture that went viral of a person dunking the cookie in a glass of milk using a fork as a way to keep their hands clean. To honor all those cooking in innovative ways, Oreo launched a series of online videos showcasing top chefs Roy Choi, Michael Voltaggio and Nguyen Tran using the humble Oreo as an ingredient in tasty, dinnertime recipes. It’s not quite #dunkinthedark, but we like it. In October, an American tourist ended up trapped in a Waterstones store when staff locked up for the night, leaving him to desperately tweet appeals for rescue to the store’s Twitter account. After freeing David (we hope! 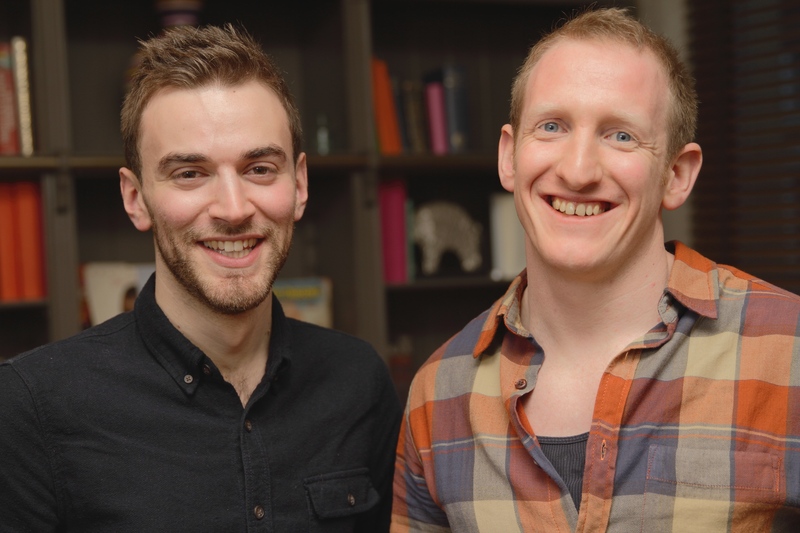 ), Waterstones and Airbnb teamed up to offer book lovers a night in a bookshop. The offer allowed ten customers to purposefully stay overnight in Waterstones flagship branch in Piccadilly, in order to take advantage of the social media buzz created from the original story. The stay took place for the 10 entrants who offered the best answer in revealing which book they would read if locked inside a bookstore overnight, and one guest. Next up: a social media campaign that’s out of this world (sorry)! In honour of Earth Day (April 22, 2014), NASA asked the world to take part in a Global Selfie. Pictures of different landscapes submitted through a plethora of social channels that included the hashtag #GlobalSelfie were collated to form a mosaic picture of the world. 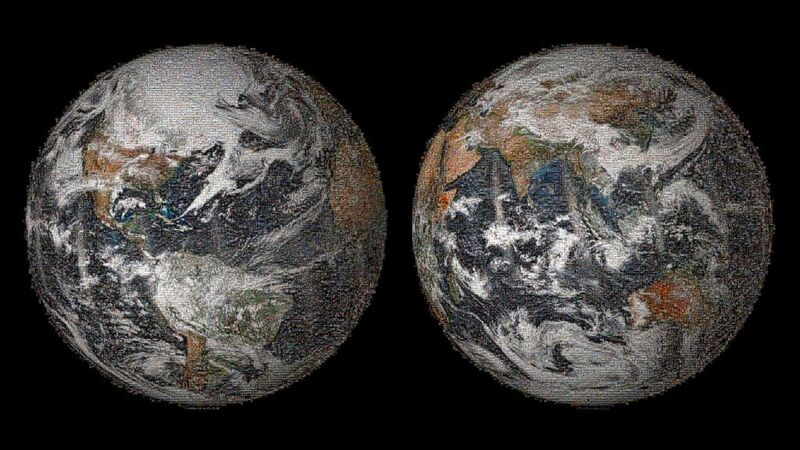 The finished 3.2 gigapixel Global Selfie mosaic, hosted by GigaPan, was made with 36,422 individual images. Earlier this year, Marc Jacobs was looking for a new face for his contemporary label. What better way to run a casting call than through social media? Jacobs took to Twitter to announce his #CastMeMarc casting call, which encouraged fans to submit their best photos in the hopes of becoming the brand’s newest face. The competition received over 70,000 social media submissions. 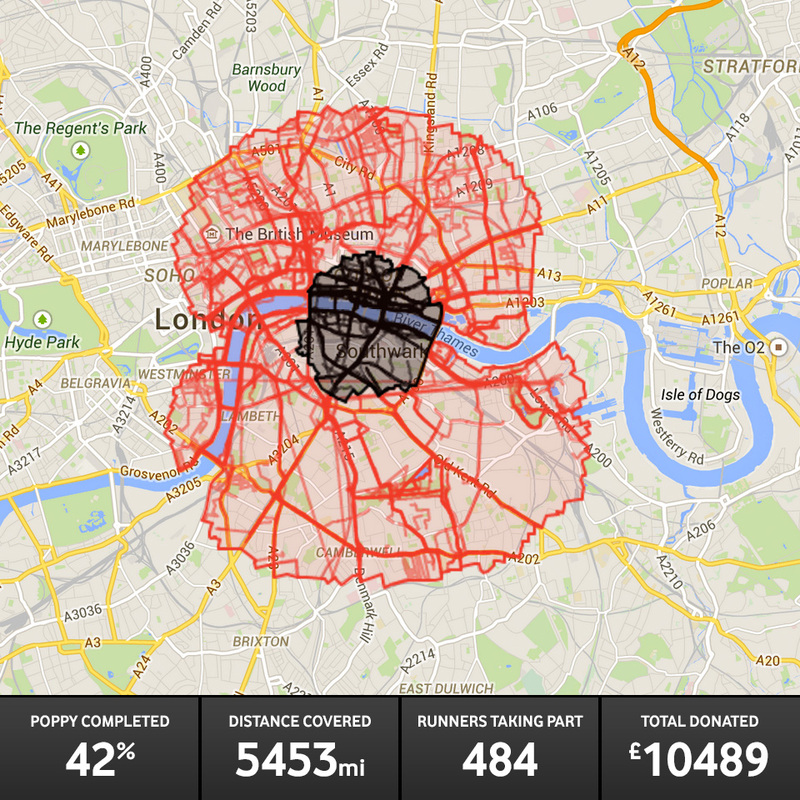 Ahead of Remembrance Day, a former Royal Marine commando completed a 31-mile run through London in the shape of a giant poppy to raise money for the Royal British Legion’s Poppy Appeal. Ben McBean was badly injured in a landmine blast in Afghanistan in February 2008. McBean lost his left arm and right leg. The Royal British Legion supported him during his recovery. Having completed his journey, 27-year-old McBean asked the public to help him raise money by running through London within the poppy’s outline using running apps and sharing their images through social media. What a guy! The Vodafone Foundation pledged to match every pound donated up to the value of £100,000. Teddy bears have been putting smiles across the faces of children for over 100 years, and now thanks to Amaral Carvalho Hospital and some very clever technology, they’re spreading joy for a whole new reason. ‘ELO’ is a toy bear which carries audio notes sent via messaging service, Whatsapp. It was created for young cancer patients, who spend a very long time in hospitals isolated from their family and friends. What an incredible use of social media to improve the lives of those children – hats off to them! To mark the opening of the new Information Age exhibition at the Science Museum, the Queen sent her very first tweet in October this year (well, she pressed a button on a pre-written tweet). In celebration of advancing technologies the Queen posted the Tweet from the official @BritishMonarchy Twitter account. The British Monarchy Twitter account was set up in 2009, but all the tweeting until that point had previously been uploaded by staff. Paddy Power broke the internet earlier this year with a tweet of a picture m it look like they’d chopped down a huge chunk of the Amazon. Thankfully, the cheeky chaps at Paddy Power hadn’t actually harmed any trees for the stunt – they revealed soon after that the whole thing was some clever visual trickery. An interesting way of raising awareness of their own brand, and for Greenpeace, who instigated the stunt. Well, it wouldn’t be Paddy Power if it wasn’t a bit naughty! 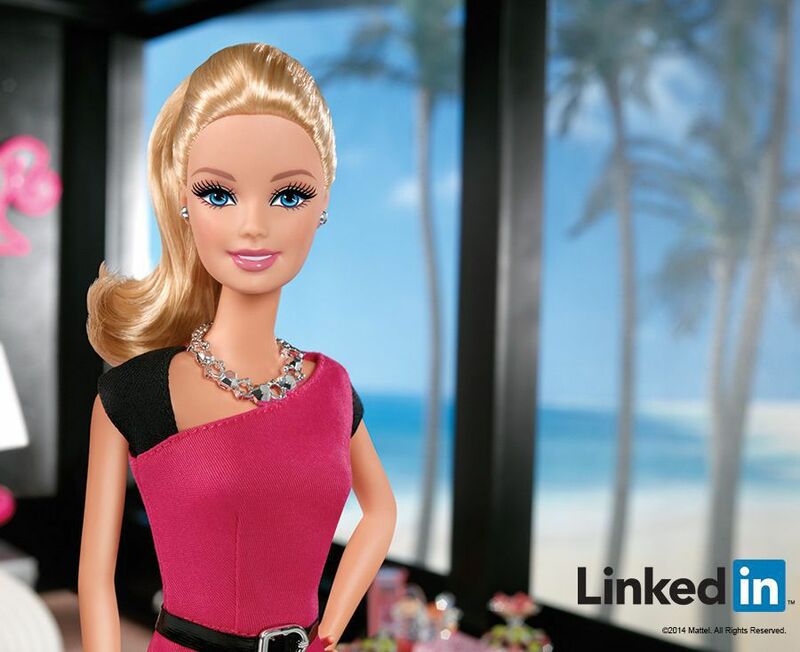 After 55 years and more than 150 careers, Barbie finally launched her LinkedIn page in 2014. LinkedIn users can follow Entrepreneur Barbie for business inspiration. She also shares news about her company, social media updates and her (very lengthy) CV. We love a good Twitter-scraping tool here at Umpf, and Butlers Bingo launched a belter of one ahead of Valentine’s Day this year. Their #TweetHeart app matched together Twitter users based on their online conversations. To our amusement, the app put together our very own @EllieHallsworth with colleague @MattRant. Auto Trader (the used-car magazine and website) launched a week-long competition in December across Facebook, Twitter and Instagram, using the hashtag #DrivenByMe. Users were encouraged to share a picture of their car using the hashtag, with one lucky winner being selected to have their car built as a Lego model. Awesome! To mark the launch of Greggs’ beloved Christmas pasty, the sandwich and pasty shop introduced seasonal style paper bags with Father Christmas beards. 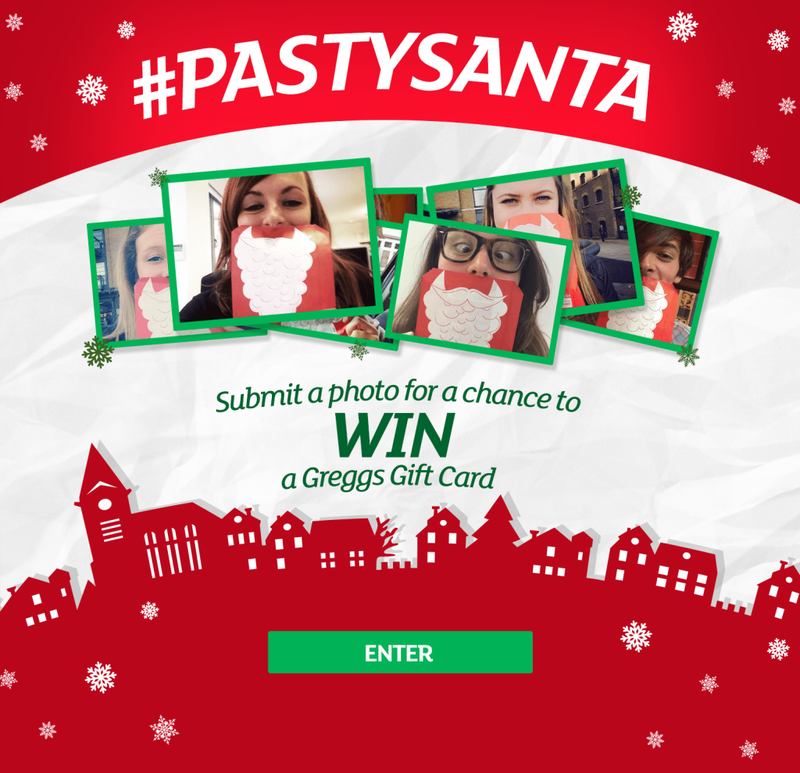 Customers could submit their #pastysanta selfies on Twitter or Instagram to be in with a chance to win a whole host of festive prizes. It’s a great why of both driving product sales and social buzz. Nice one guys! 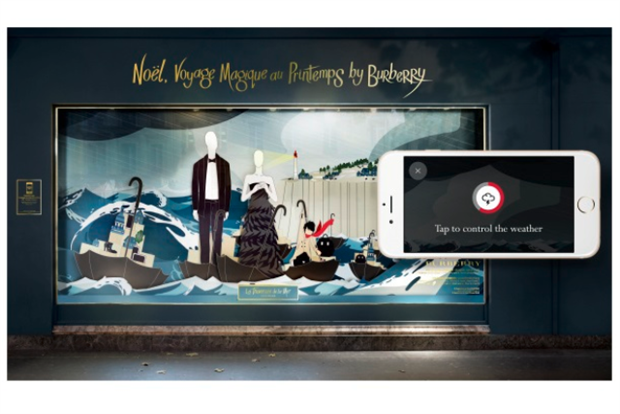 Burberry is currently telling its own Christmas story through interactive shop windows at Printemps, the Parisian department store. The windows show a boy travelling with his teddy bear from Burberry’s Regent Street flagship store to Printemps in Paris. Visitors can interact with individual scenes, and are able to access extra content via their browsers. They are also able to control the weather and steer a fleet of boats! Users are able to create virtual postcards showing a festive scene displayed on the windows, and are encouraged to share them on social media. It’s an innovative festive campaign that’s bags more ‘Aww’ than ‘Yuck’!